How about a new career in the world of finance? Medway Community Learning’s course, Learn Sage Payroll, will show learners how to process the payroll, process wages and calculate PAYE and NIC, produce relevant reports, create E-submissions and BACS processing using Sage software. The eight week course starts on Thursday, 11 October from 1pm to 3pm at Eastgate, Rochester. For more information phone 01634 338400. Medway Council Environmental Protection Team has won a national award for its work. The team entered the RSPCA Community Animal Welfare Footprints Awards 2012, and won the English Unitary Council Innovator Award. Sign up to a new course and a new skill with Medway Community Learning. Level 1 Award in British Sign Language starts on Wednesday, 9 January 2013. Interviews are taking place now for those people interested in this course. The course is over 36 sessions and takes place every Wednesday from 7pm to 9pm at Eastgate, Rochester. Course fees starts from £180. An event to give young people with additional needs advice on jobs, advice and activity opportunities is coming to Medway this week. Competition runner up Tea Wilson (age 6) from Hempstead Infant School meets the MAD bikes display team who judged her helmet design. Visitors to this year’s Kites & Bikes festival at Capstone Country Park were undeterred by Sunday’s rain. Around 350 people attended the event and were treated to amazing mountain bike stunts by the fantastic MAD mountain bike display team. Children also made the most of 25 crazy bikes, bike powered carousel and spin art run by the APE Project. Families enjoyed the craft and museum tent where they made bird feeders and had the chance to view a range of historic bikes from the Guildhall Museum’s collection. Four regional kite organisations also braved the elements and were able to fly more than 20 large kites until rain finally stopped play at 2pm. This year the event included a pre-festival primary schools competition to promote cycle safety by designing a cycle helmet. 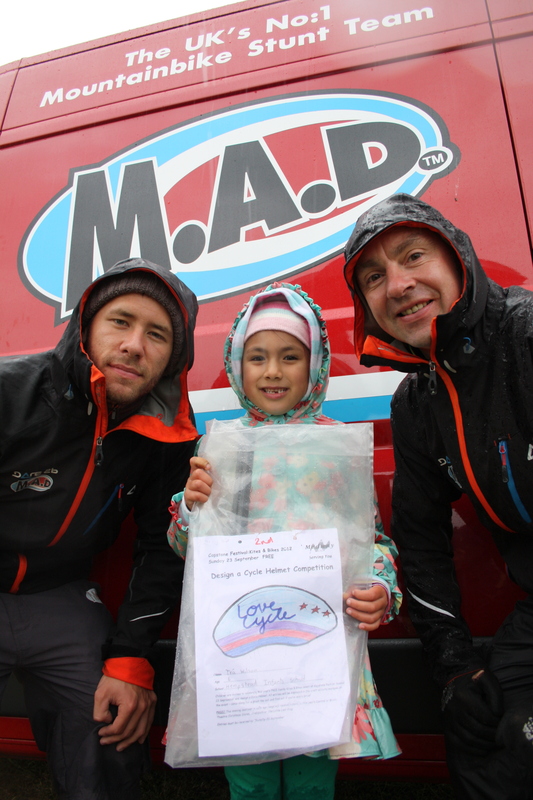 And the MAD bikes team were more than happy to judge the 170 entries on display in the craft tent. Pupils from St Margaret’s at Troy Town School and Hempstead Infants schools won prizes to see the Christmas shows at The Brook Theatre – The Little Lost Frog – and The Central Theatre panto – Cinderella. Runners up received kites. Picture caption: Competition runner up Tea Wilson (age 6) from Hempstead Infant School meets the MAD bikes display team who judged her helmet design. Medway Council’s Road Safety Team is celebrating after winning a Green Apple Environment Award for the innovative ‘walking bus stops’. The team were competing against more than 500 other nominations in the national campaign to find Britain’s greenest companies, councils and communities. The innovative work that impressed the judges was the Walking Bus Stops. These are permanent bus stops that mark the pick up stops on the successful Walking Bus Scheme. Local organisations sponsor a stop and support the walking bus, which aims to reduce congestion on Medway’s roads, improving air quality and improving road safety skills of children travelling to and from their school or after school club. As a result of this success the team has been invited to have their winning entry published in The Green Book, the leading international work of reference on environmental best practice, so that others around the world can follow their example and learn from their experience. Safer Journey Officers will be presented with their Green Apple Award at a presentation ceremony in the House of Commons on 14 November. They will also be considered to represent the country in the European Business Awards for the Environment. This week sees a series of events to help warn people about the dangers of loan sharks throughout Medway and the Hoo Peninsula. Medway Council’s Trading Standards Team and The England Illegal Money Lending Team will be warning local people to turn away from illegal money lenders and encouraging anyone who has fallen into a loan sharks trap to speak out. Make sure your unwanted household furniture goes to a good home, by taking it to one of Medway’s three Household Waste Recycling Centres. In a new scheme launched this month (September) Abacus Furniture Project (part of the registered charity West Kent Extra), now makes weekly visits to the centres to look for second hand items which can be sold at low cost to families in need, while preventing the items from going to landfill. Any unwanted items that are too good to throw away are welcome, such as tables and chairs, chairs, sofas, beds, bedroom furniture and garden furniture. If taken, the items will be made available to the public to purchase from the Abacus store at 67 Cuxton Road, Strood. The furniture that is left at the Household Waste Recycling Centre will go for recycling where applicable. The RE-use scheme is run by Medway Council in partnership with FCC, which manages the three recycling sites. The three household waste and recycling centres in Medway are located at Ambley Road, off Hoath Way, Gillingham, Shawstead Road, Capstone, Chatham and Sundridge Hill, Cuxton. All three sites are open between 8am and 4.30pm Monday to Saturday and from 9am to 4pm on Sundays and bank holidays. The Medway Community Safety Partnership is holding a series of community engagement meetings for residents across the area from next month. Meetings will take place on a three-monthly basis in local areas across Medway. The first will take place on Tuesday, 9 October, between 7 and 9pm at the All Saints Church, Magpie Hall Road, Luton. The purpose of the meeting is to allow local community safety issues to be discussed with representatives from Medway Council and Kent Police. Medway Community Safety Partnership Chair Councillor Mike O’Brien will be there to answer questions alongside representatives from Kent Police and Medway Council. These will include Kent Police Chief Superintendent Neil Jerome and Medway Council’s Robin Cooper, the Director of Regeneration, Community and Culture, and its Assistant Director for Frontline Services Andy McGrath. Cllr O’Brien said “We plan to conduct a series of meetings with residents in areas across Medway to give them the opportunity to discuss community safety issues where they live. For further information members of the public should please call 333333. 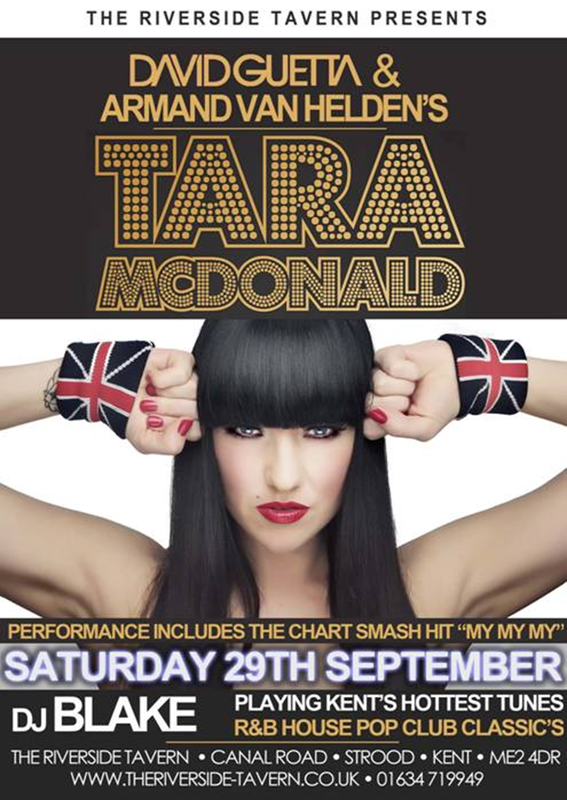 Tara McDonald is a local musician and singer and has just signed a two album deal with a major record company, why not pop down and see what it’s all about. Just to let you know this young lady has won a number of awards including best voice awards. A delegation opposed to an estuary airport has traveled to Birmingham to see how its airport can significantly increase capacity, lessening the need for a new south east hub airport. Parents and carers of children heading to secondary school for the first time next September can apply online for their child’s school place from next week. Applications for secondary school places open on Monday, 10 September at www.medway.gov.uk/onlineadmissions. Parents have until 4pm on 31 October to name up to six secondary school preferences for 2013. If you haven’t yet read or received a copy of the news letter, please click on the link below to see what amazing work the teams and supporters of Anim-Mates are doing. Maybe you could even help out in some way? Rumours are begining to circulate about a group planning a new 4 runway airport west of London.